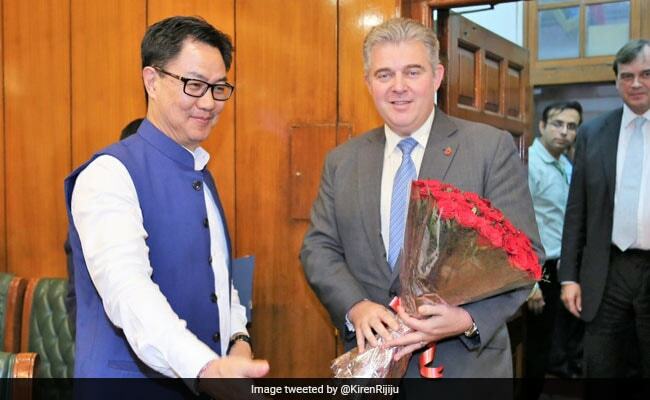 As Kiren Rijiju, the Union Minister of State for Home, met with his British counterpart today, a recent UK court order hung heavy between them. The order, linked to a bookie wanted in India, may impact the government's request for liquor baron Vijay Mallya's extradition. The Westminster Magistrate's court in London, which is handling the Mallya case and is set to take it up in two weeks, recently refused to send bookie Sanjeev Kumar Chawla to India after an expert cited "unsafe, inhuman and degrading" conditions in Delhi's Tihar jail. In her judgement, District Judge Rebecca Crane said, "I am not satisfied that there is an effective system of protection against torture in the receiving state. While the Supreme Court in India has raised concerns about prison conditions, the court has found little has changed in practice and overcrowding remains a problem. Evidence suggests... monitoring systems are not effective in practice." Mr Rijiju, in his meeting with Brandon Lewis, pushed for 13 extraditions - including that of Mr Mallya, Indian Premier League founder Lalit Modi and Sanjeev Kumar Chawla. "We made our position clear. The response is positive from the government's side but there can't be a detailed discussion as the matter is in court," the minister told reporters. Sanjeev Kumar Chawla is accused in the match-fixing scandal of 2000 involving Hanse Cronje, the former South African captain. Ms Crane noted in her order that there were "strong grounds for believing that Chawla would be subjected to torture or inhuman or degrading treatment or punishment in the Tihar prison complex, due to the overcrowding, lack of medical provision, risk of being subjected to torture and violence either from other inmates or prison staff which is endemic in Tihar." The ruling was based on a report by Alan Mitchell, a member of the Scottish Human Rights Commission. He prepared two reports, in November last year and February this year, but he visited a prison in Alipore, not Tihar, because he didn't get permission. Dr Mitchell noted that there was 227 per cent overcrowding in Tihar, "which alone is sufficient to consider a real risk to (human rights) being breached". He also referenced a report that suggested that torture remained "endemic and institutionalised" in Indian prisons and there were an "alarming number of deaths in custody, particularly unnatural deaths." Though the judge said there was nothing to indicate that Chawla would not receive a fair trial, she felt "in the light of findings that being held in Tihar prison poses a real risk of breach of (human rights), India's assurance was insufficient and didn't detail how rights would be protected." Vijay Mallya, 61, is wanted in India over for defaulting on loans worth thousands of crores in India. He slipped out of the country in March last year, amid attempts by a group of banks to recover more than Rs. 9,000 crore loaned to him for his defunct Kingfisher Airlines. India made an extradition request in February to Britain to send back the businessman to face trial. Last month, he was arrested in London and released on bail for the second time this year in a case of money laundering filed by Indian authorities through UK's state prosecutor.